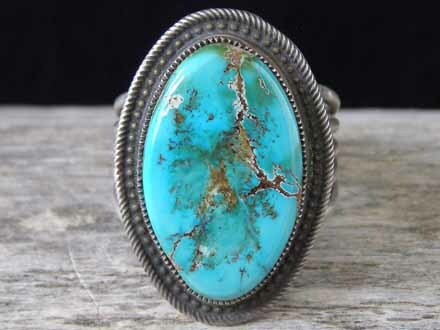 This ring by Navajo silversmith Rick Martinez is set with a large oval of natural, untreated King's Manassa turquoise from Colorado. This mine is no longer in production and such stones have become rare. Rick set the stone in a handmade serrated bezel and wrapped the bezel with raindrop wire before adding a rope of twisted square wire around the edge to form the border of the ring face. The shank consists of four lengths of round wire with a band of twisted square wire sandwiched between the round wire bands. The lengths of wire forming the shank are fused on the side of the shank and in back, but split into individual bands in front (forming a split shank) before attaching to the ring back. This is a unisex design which works equally well for men or women. Hallmarked R. Martinez and stamped STERLING and NAVAJO inside on the ring back. Stone: 1 1/16" x 5/8"
Ring face: 1 5/16" x 7/8"